I'll try this pattern one more time, totally blending my values from light to dark, a design that is visually calming. That plan was where I started in the first place, about 6 Kaleidoscope quilts ago! I found a neutral soft gray thread that blends nicely for quilting. While I'm not thrilled with the overall busy design, I CAN say, "it's very interesting." On another subject, last night I returned from a 2-day drive East, across Nebraska and back, for a State Quilt Guild meeting. The drive was pleasant, with good company, an unexpected meeting at McDonalds with another member I didn't know well, about midway (who surprised me by quoting my blog! ), and overnight stay with another gracious member, a tour of her beautiful, quilt-filled home, an official meeting, and back across the state again, with one quilt-y stop at a lovely shop in York, and back again, arriving home for bedtime! Whew - I am weary today! That's about 15 hours of driving (oh yes, and talking most of the time! Talking a mile a minute kept both of us from getting sleepy! Back to the chiropractor tomorrow. I'm moving slowly, but moving. The time involved with adjustments, crashing and long naps after adjustment, definitely impacts my quilting time, dang it. 8-((( And I must admit to a few hours of self-pity, depression, and "poor me's". It's absolutely T-rific, and I love the name. Hope you feel better soon. I really like how you pushed pass the limits on this. I enjoy the 2ndary patterns that are showing up here - they really POP! Just goes to show what can happen if you just push a little. This one, well, I have to say I'm sort of falling in love with it! I'll bet that 15 hours of driving did you skeletal structure no favors, he? I think the visit with your Chiro will is much needed. My friend, I certainly understand the how longer-than-planned pain can impact the quilting & life. I've been face to face with that self-pity and depression and poor me, too. No words of wisdom will you hear from me. That's because you have it all inside you to endure. YOU Know. I'm just glad you ALLOWED yourself a few moments of "down in the dumps" time. It's part of the process and experience. I'm surprised to tell you the truth. Gotta do that sometimes though, ya know? Hey, I really like this quilt top...but I am a fiscally conservative person so I guess my quilting and politics are diametrically opposed! Give your body a chance to heal...15 hours of driving is tough on everyone! I like this one a lot! I'm sorry you are in pain after the long drive but it sounds like it was fun. I've been missing your posts. Glad you are back home safely and that your body coperate so you can do more quilty things. BTW, I like the quilt. Thinks it'. just fine. I love it, can't see anything wrong at all. I would call it balanced budget, lol. As Karendianne said, the secondary patterns are terrific. I think it's great Elaine, but then I love scrappy string quilts. Hope the chiropractor can get your back sorted out after the long drive, but it sounds like you had a fun time. It's ok to have a bad day, but you will feel better again. I like your quilt. It is very energizing. Hope you are feeling better. Love the quilt and the name is fantastic. I hope your back problems are soon over. Anything that negatively impacts on quilting time is not a good thing. Elaine... ditto.... I like this one and you gave it an attention getting name to go with the design. 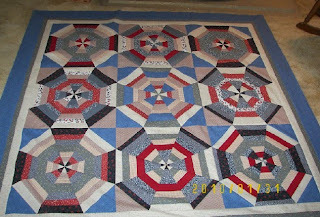 It is not a boring quilt! Glad you had a nice trip. Fatigue-this too will pass. Driving 15 hours adds to the "ouch, poor me" but you WENT!! And had fun and met people and stopped at the fabric shop. Sounds like it was a GOOD time!! Love how this came out!! I like the quilt and like the name. I do hope your arm and shoulder problems ease up a bit. I am doing my exercises and feel much better after a month or so. I agree with Karendianne, I noticed the secondary patterns quickly and like them! It doesn't seem at all out of control to me, not any more than the others you have made. That's a lot of sitting in a vehicle and probably didn't help your neck and shoulder at all, even if you were the passenger! Hope things get worked out and make you more limber and pain free very soon. Sorry your back is giving you fits. Pity parties are sometimes needed, as are naps. Take care of yourself. How nice that you put the effort in to get to Bonnie's class! How I would love to meet her someday! I'm sorry your back/neck is still acting up. That must really cut into your quilting time and of course quilting time should be therapy for those down times. You are doing beautfiul work nevertheless!